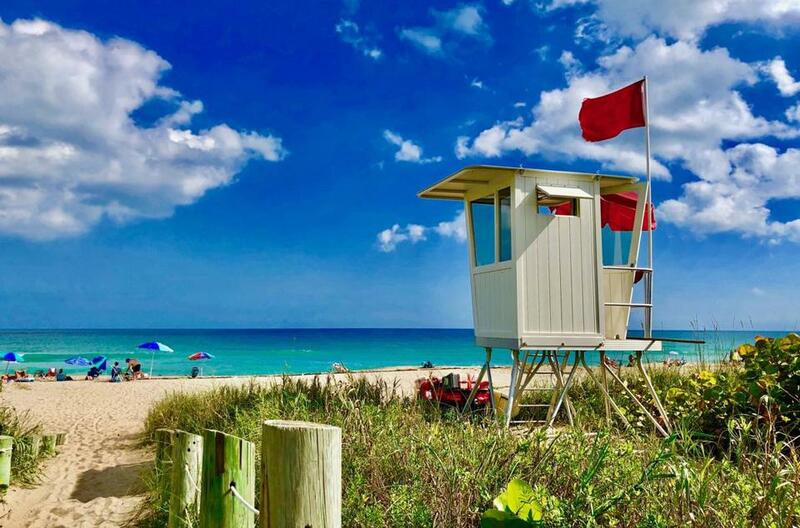 A lifeguard station on Hutchinson Island in Stuart. LAUDERDALE-BY-THE-SEA, Fla. — This was either a bar in south Florida, or a man cave in Braintree. I was surrounded by Boston Red Sox and New England Patriots paraphernalia. There was a Celtics game on TV. A woman sat beside me wearing a Gronk jersey and flip-flops and made Super Bowl predictions. “What’cha youse think?” she asked the bartender at the Village Pump, who I suspect had been down this end zone many times before. It looked and sounded as if I was in a Boston neighborhood bar. Only I wasn’t. I knew this because it was December and there were palm fronds dancing in the 70-degree breeze. But Lauderdale-by-the-Sea might as well be called Boston-by-the-Sea because the small town adjacent to Fort Lauderdale is a favorite for Bostonians looking to escape their frigid environs. Lauderdale-by-the-Sea was one of four towns I determined, through a very unscientific formula, to be unsung and underappreciated east coast Florida treasures. I decided to visit them all during the span of a week. In the case of Lauderdale-by-the-Sea, it seemed as if I was the only Bostonian who wasn’t aware of its charms. I went on a food tour with a group that included a woman from Quincy and another from Weymouth. At the Beachside Village Resort they throw pool parties to celebrate the Patriots and have brought a Cape and Islands vibe to the decor. The Village Pump bar sponsors bus trips to Miami when the Patriots play the Dolphins. If you’re looking for a Florida escape, but you’re afraid of getting homesick, I think Lauderdale-by-the-Sea should rapidly ascend to the top of your vacation wish list. Before I get ahead of myself, let’s have a look at the four under-the-radar Florida beach communities that are worth a visit this winter. Even if you’re not looking for Boston-by-the-Sea, Lauderdale-by-the-Sea is a charmer. 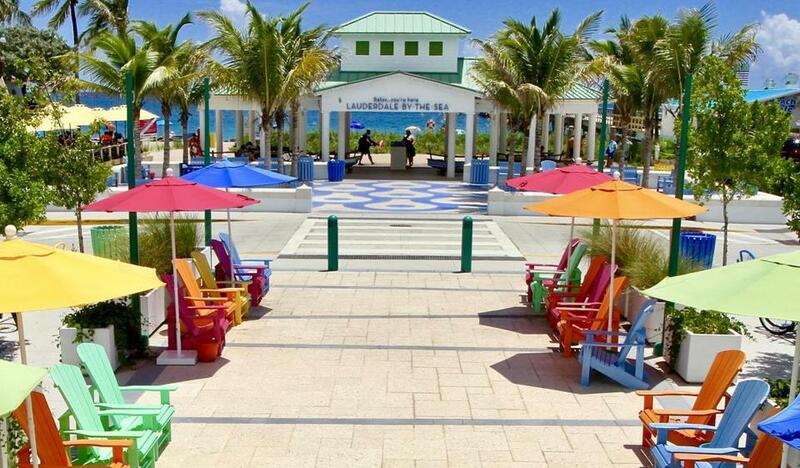 It’s impossible not to be taken with the parade of neatly lined pastel Adirondack chairs and umbrellas that lead up to the town’s fishing pier. The town restricts building heights to four stories, so unlike nearby beaches in Florida, Lauderdale-by-the-Sea is not flanked by imposing towers. Instead, many of the older hotels and downtown buildings were designed in the MiMo style (that’s Miami midcentury), which, in the case of Lauderdale-by-the-Sea, is characterized by distinct concrete blocks that look as if they’re straight out of 1962 — likely because they are. Adirondack chairs flank the park leading to the beach in Lauderdale-by-the-Sea. Sports memorabilia and architecture are all fine and good, but what about the beach? It’s lovely and runs the length of the town. It’s particularly popular with divers since there’s a reef just 100 yards off shore. Reef-related art throughout town is almost as plentiful as Red Sox caps. There are a surprising number and variety of restaurants here for a town of this size. I wouldn’t have expected good Jamaican cuisine, but I found it. I took a food tour through South Florida Food Tours, and I’m glad I did, otherwise I would have missed the Cookie Shop. It’s the definition of a mom and pop bakery tucked away on a side street. The best day to visit is Friday pie day, which I contend should be a weekly national holiday. I missed pie day, so I consoled myself instead with a prosecco pear mascarpone popsicle from Hyppo Gourmet Ice Pops. There are stretches of Florida that appear to be little more than thick necklaces of highway bejeweled with strip malls and palm trees. I love a good nail salon and Waffle House as much as the next guy, but there are times a man craves more. That’s why Stuart (and Martin County) landed on my list of underappreciated east coast Florida towns. You could have knocked me over with a pelican feather when I walked through downtown Stuart on a Friday night and it was buzzing like a cluster of yellowjackets over a jar of jam. I was expecting sleepy, instead there were pensioners dolled up on their way to dinner, lots of young families, and high school students strolling around serenading al fresco diners. The town is filled with independent shops, boutiques, and essential ice cream parlors. I opted for dinner at the Gafford, where executive chef Taylor Wilson confirmed my suspicions about Stuart: There was a lot happening. He told me to go to the Saturday farmers’ market (check), stroll the River Walk (check), and explore the beaches (triple check). For beach research I headed directly to Hutchinson Island, a spit of land that hugs the coast. I ended up spending most of my time at the family-friendly Jensen Beach Park. I’ve learned the only way to truly study a beach is to take a nap on it. So for journalistic purposes, I slathered myself with sunscreen and dozed. There are museums and historic sites throughout the region, but if you’re coming to Florida during the winter, you’re probably not looking to spend time inside. I took an eco tour of the region’s estuaries and rivers through a company called Riding the Waves. I drove a power catamaran around the waterways, learning about estuaries and rivers while trying not to steer the boat into mangroves. 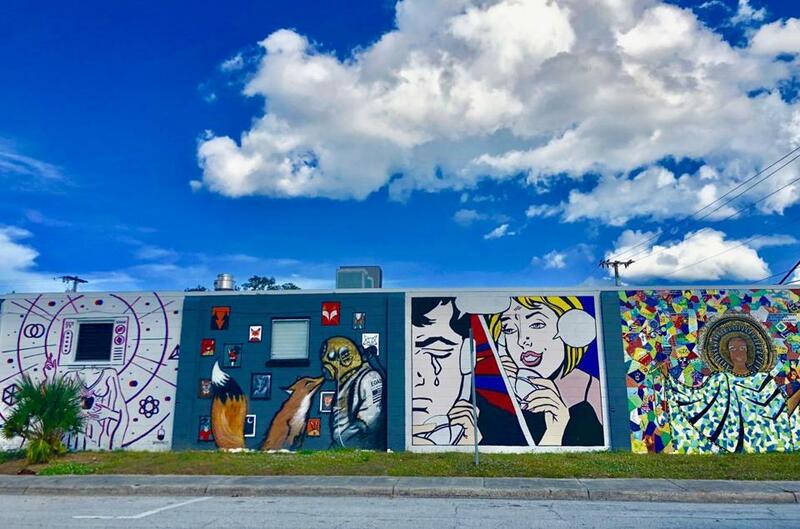 A wall of murals in the Eau Gallie Arts District of Melbourne. What thoroughly wowed me about Melbourne — aside from restaurants and beaches — was the Eau Gallie Arts District, a corner of the city filled with murals by artists from across the country. I’ve been in larger cities with fewer murals (this means you, Boston). With culture, shopping, and restaurants checked off my list, I was ready to brave the Treetop Trek at the Brevard Zoo. I’m usually not a sucker for reviews on Trip Advisor, but when I saw one that read “Make sure you know Jesus if you do the zip line across the gator pond,” I immediately knew I would be zip lining across the gator pond. You don’t need to know Jesus, but you do need a good pair of lungs for screaming. The fourth and final stop on the unsung Florida beach town tour landed me in New Smyrna Beach. I’m aware that I’ve been yammering on with amazement about quaint downtowns in Florida. 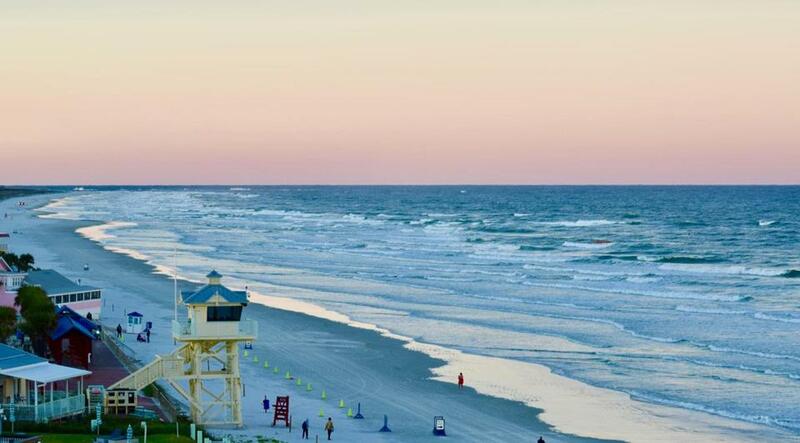 New Smyrna Beach didn’t disappoint because it has two downtowns, along with 17 miles of beach. New Smyrna Beach is north of Orlando, and here’s where my trip started getting a bit chilly. I wore a coat on the beach at night, because after being in Florida a week, 60 degrees felt like an Arctic cold snap. There would be no sunbathing, but there would be kayaking. I booked a trip with a guide from the Marine Discovery Center. Some days you can spot dolphins or manatees in the Indian River Lagoon. We didn’t see marine life, but there was no shortage of birds. Also spotted in the sky that afternoon was a rocket launching from Cape Canaveral. Beach walkers enjoy the sunset in New Smyrna Beach. New Smyrna was the bittersweet end of the trip, meaning during my final dinner I was bitter that I had to come home, and the sangria I was drinking at Cafe Verde was sweet. Was this feeling bad? Absolutely not. It only meant that my intuition was correct. If I’d had a lousy time I’d be itching to get home. Instead I was feeling homesick for the Boston sports talk in Lauderdale-by-the-Sea.